The car’s windshield is an important safety feature and should essentially remain clean in order to provide a good view while driving. When referring to windshield cleaning, people usually get the exterior part of the glass cleaned as it gets exposed to dust, bugs and a lot of other stuff. However, it is equally important to clean the inner part of the windshield glass as well. Most drivers usually skip cleaning the inner part because of the angle of the glass of the glass and due to the dashboard in between. 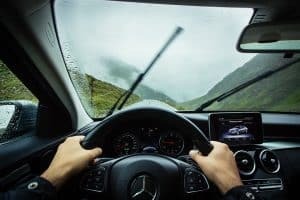 In this article, we will discuss how to clean the inside of your windshield easily to provide you with excellent visibility while driving during any time of the day. Whenever you clean your car’s interior, dashboard or the seats, the dust and grime usually get deposited on the windshield as it is most visible. This leaves your interior sparkling clean but the windshield gets dirty and therefore causes visibility issues while driving. This is perhaps the primary reason why your windshield gets dirty over time. Many people are not aware of the term off-gassing. The dashboard of your car is made from plastic which contains a number of chemicals and oils. Over time as the dashboard gets exposed to sunlight, the high temperature causes the plastic to breakdown and release harmful oil and other substance which gets deposited directly on the inside of the windshield. Since these oils will not be easily visible, cleaning them using just water is not a good idea as well. Using oily or greasy cleaners to clean the dashboard is not recommended as well especially if you live in a region with hot weather. A lot of drivers tend to smoke while driving. The smoke produced by cigarette also contains dirt particles which get accumulated everywhere in the car including the windshield and reduces the visibility. If you have children, there is definitely a chance that your car’s windshield has fingerprints on the inside. The dirt from the fingers gets stuck on the windshield and obstructs the driver’s view. Once you have gathered all the right equipment, start by cleaning the outside of the windshield first. Using clean water, spray on the windshield and wipe using the microfiber towel. After it’s dry, use the glass cleaner to clean again and this time use a clean towel. Do not use a circular motion, in fact, clean it up and down and left to right motion. Once that is done, it is time to clean the inside of the windshield. Using a clean microfiber towel, first, wipe off any dirt from the inside of the windshield. Make sure to clean the whole glass from the driver side to the passenger side. To clean the area near the dashboard, sit on the seat with your back facing the dashboard and with your hand in the backward direction, clean the tight spots. Once the windshield is clean, it is time to decrease it using Mr. Clean Magic Eraser. This kitchen scrubber works perfectly to remove any stubborn stain as well as oily residue which may not get easily removed with a cloth. Dip the Magic Eraser in clean water and clean the glass using a circular motion. After cleaning, wipe off any liquid using a towel. Once the windshield is completely dry after cleaning with the Mr. Clean Magic Eraser, it’s time to clean again using a glass cleaner this time. Take a clean towel and spray the glass cleaner on it. First, use a circular motion to apply the glass cleaner thoroughly and then wipe it using another towel in up and down direction. You can either mix half portions of both water and alcohol then mix it with a capful of white vinegar or you can use 70% water and some window cleaner along with the same amount of alcohol. Using an ammonia-based cleaner is not recommended as it can damage the car’s dashboard, seats, and other interior components. Here are some important pointers you should remember while cleaning the inside of your windshield. Clean the inside of your car windshield at night or when the temperature is cooler. 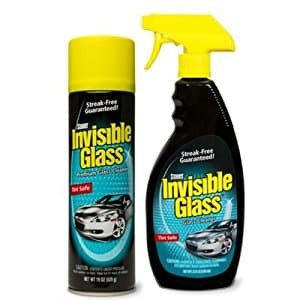 This will prevent the glass cleaner to evaporate quickly. In hot sunny weather, you’ll notice that the glass cleaner will get evaporated much quickly compared to cool weather. Always use a clean towel or rag when cleaning the inside of your car windshield. Using the same rag or cloth to clean other parts of the car as well as the windshield will leave marks and dust on the glass. It is recommended that you also use multiple towels to clean the windshield for a better result. Now that the inside of your car windshield is clean and sparkling, it’ll be nice if you maintain it properly. Keeping your car parked under the shade or in the garage is a good idea as it will prevent the oil and grease from the dash to get accumulated on the glass. You can also prevent off-gassing by slightly opening the windows while the car is parked.